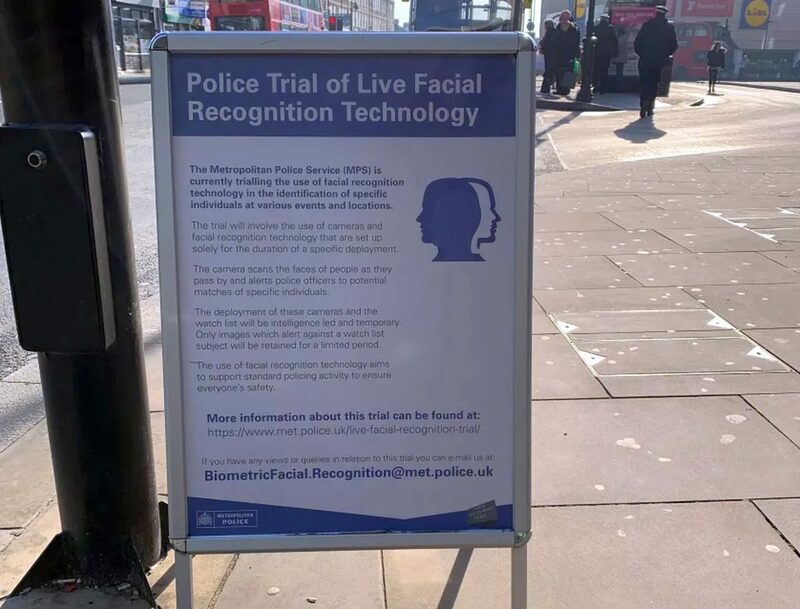 At the end of January, the Metropolitan Police held the latest trials of facial recognition technology that is intended to pick out suspects from crowds, using cameras that scan faces to see whether they match images on a database of targets. A mobile unit was parked outside Romford station on 31 January. Campaigners from Big Brother Watch, who have highlighted how 98% of automated facial recognition ‘matches’ by the Met have actually identified the wrong people, were present and handing out leaflets. Are you allowed to cover your face? Did the officers who issued the penalty notice exceed their powers? What happens if you are wrongly identified as a suspect? We offer some general guidance on your rights if you happen to walk into the middle of the latest trial of this new technology. Can I legally cover my face? The short answer is yes. There are very limited circumstances where the police can insist that you remove a face covering and normally this is in situations where they believe there is a serious risk of violence. First, senior officers must authorise the power to remove face coverings under Section 60AA of the Criminal Justice and Public Order Act 1994. If a Section 60AA authorisation has been given, then officers have the power to compel you to remove any item that they reasonably believe you are “wearing wholly or mainly for the purpose of concealing your identity.” An officer can also confiscate the item you are using to cover your face. Wearing a covering over your face is not in itself illegal – you risk arrest, however, if you fail to remove an item you are wearing when instructed to do so using Section 60AA powers. Authorisation for the use of this power can stand on its own or applies automatically when combined with a “section 60” notice, which gives officers the powers to search people, in a defined area during a specific time period, for dangerous objects or offensive weapons, on no other grounds than there is a risk that serious violence will take place. So why was an on-the-spot fine issued? 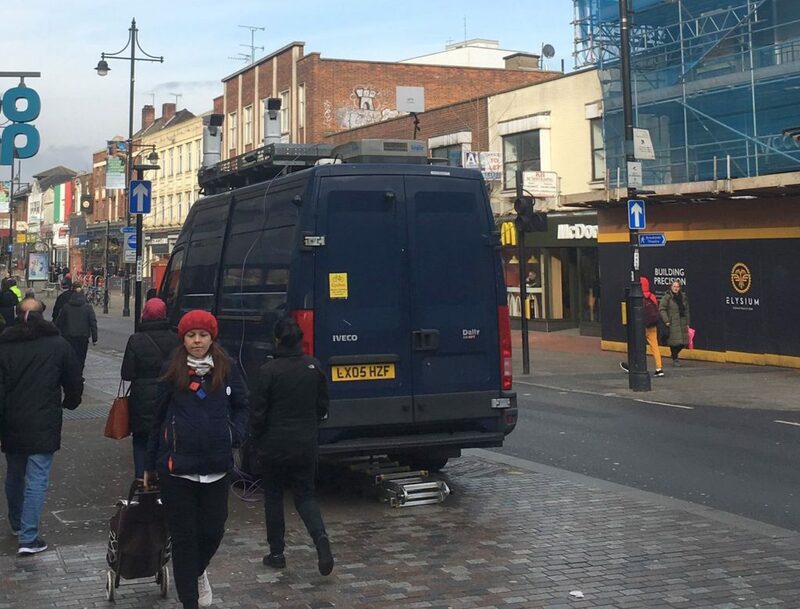 The man who was stopped by police in Romford could have reasonably challenged them to explain what powers they were relying upon to detain him. There was no Section 60AA authorisation in place at the time. However, officers do have general powers to stop you and ask you what you are doing, where you have been, where you are going and what you are carrying. They do not, however, have the power to force you to stay with them if you are stopped and asked for your actions. The police claim the man they challenged became abusive: our understanding is that he swore at them. It appears that this was treated as an offence under section 5 of the Public Order Act 1986 (“words/behaviour likely to cause harassment, alarm or distress”), which is one of a number of offences where officers can issue a “penalty notice for disorder”. These are normally used for low level crime or anti-social behaviour, often for street drinking or small-scale cannabis possession. On the face of it, it looks like a rather petty punishment for refusing to cooperate with their facial recognition trial. The police cannot force you to accept a penalty notice for disorder but if you refuse to cooperate, they are likely to arrest you. This is a reminder of the importance of always remaining calm if you are stopped by the police, if you want to avoid giving them an opportunity to arrest you. Remember too that you are not legally obliged to give them your personal details. What if I am stopped as a suspect? Facial recognition technology is notoriously unreliable: it seems inevitably, therefore, that it will mistakenly pick someone from a crowd who is completely innocent. In June and July 2018, an earlier trial at the Westfield shopping centre in Stratford in east London led to no positive identifications but six false-positive matches. There is also evidence too that the technology may pick out someone from, for instance, a crowd waiting to attend a gig or on a shopping street, simply because they have been added to a “potential risk” list related to something completely different, such as their political activities or attendance at football matches. It remains the case, nevertheless, that if the police want to detain you, they must have powers to do so. This normally means either to conduct a stop and search, or because they are arresting you for a particular criminal offence. In either circumstances, they cannot compel you to provide your personal details, not even if you are under arrest. They can, however, search you and this is likely to provide them with your wallet, credit cards and other forms of identification. Nevertheless, most people will want to clear any suspicion immediately by producing their ID to prove their innocence. This is the danger of the technology: that the onus to prove our innocence increases as the use of facial recognition spreads. The problems really start, however, if you are unable to immediately prove who you are – or if the police decide they need to investigate your identification further and detain you. If you are innocent, the prospect of having officers arrest you and take you to a police station is extremely intimidating and a massive inconvenience. It also means officers will take photographs of your face when you are processed in custody. Unlike fingerprints and DNA, which are eventually deleted after a person is arrested and charged but is not convicted of an offence, an individual’s custody image is not automatically deleted. Police have stored images of thousands of innocent people wrongly identified by the technology, creating a biometric database of innocent people without their knowledge. This is potentially unlawful and if you are arrested as a result of mistaken identity, we strongly suggest you make a formal request to the police for the deletion of your custody photos. In any event, if you are arrested, the general guidance is to refuse to answer any questions and to never accept a caution, until you have received proper advice from a solicitor you trust. 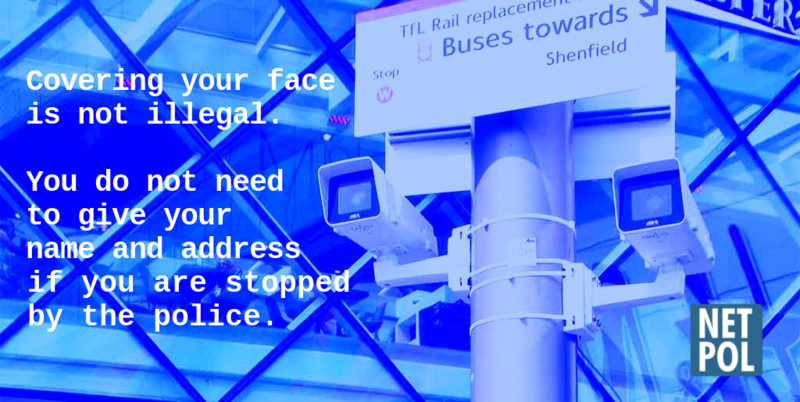 Netpol supports the ‘Face Off’ campaign launched by Big Brother Watch to highlight how facial recognition cameras pose a threat to our privacy, freedom of expression, and right of assembly. For more information see their campaign page. They will undoubtedly use facial recognition to identify people on their Domestic Extremism database, including any who are put on for political reasons, such as contesting government statements.